In Israel's history, who are the Amorites and the Philistines? Do they represent anything for modern Christians? In this book we can see spiritual problems they represent in the Christian life. In fact, in flesh and blood, geography, Tabernacle artifacts, and other things, the history of Israel in the Old Testament forms a model of the internal struggles we face as believers in Jesus. For those of you who are just starting out with Christ, or those who have been on this journey for many decades, this book can help you get your bearings. As Israel journeyed from Canaan, to Egypt, to the desert, and back to Canaan, so the Christian begins as an infant, becomes a natural, then carnal, then possibly, a spiritual man, respectively. The names of places, enemies of Israel, and other items all have meaning for us as we examine the roots of their names in Hebrew. In Semitic understanding the symbols are real people, events, and places; and their names also shed light on our walk here. Come take Jesus by the hand. Learn the lessons and overcome the problems with His help. 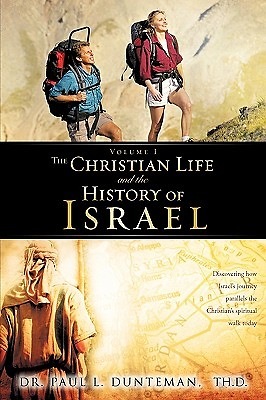 You may move ahead more surely and quickly with Israel's history as a road map before you. Let's begin Dr. Paul L. Dunteman teaches theology and Bible languages in English and Spanish at the Miami branch of the New Orleans Baptist Theological Seminary, as well as representing the organization Life in Messiah. Born and raised in the Chicago area, he has a B.A. in Geography from the University of Illinois (FBK), an M. Div. from Trinity Evangelical Divinity School, and a Th. D. from Jacksonville Theological Seminary. Since 1992 he has taught in Miami, Florida, where he resides with his wife Carmen Leticia and their 6 children and 6 grandchildren.